– Price: A single valuation estimate in GBP millions (to one or more places of decimal!). – Process: Some explanation & commentary re your Price would be greatly appreciated. It can be as long or short as you wish – no need to kill yourself though, considering the level of info. that I’m providing. Let me be even clearer on Price: Going back to my last post, think of this as a rather different game of chicken. Picture yourself squaring up to that little 6 year-old gypsy kid over a chicken. You might think you own the chicken, but for your new light-fingered friend, ownership’s a rather…slippery concept! He’s also v flexible in his business dealings – as far as he’s concerned if you’re not selling, well then you must be buying! So he’s just waiting for you to name a price – then he’ll happily buy or sell the chicken at the drop of a hat, all to take maximum advantage of you. So, what price would you quote him?! That’s the price we’re looking for here. 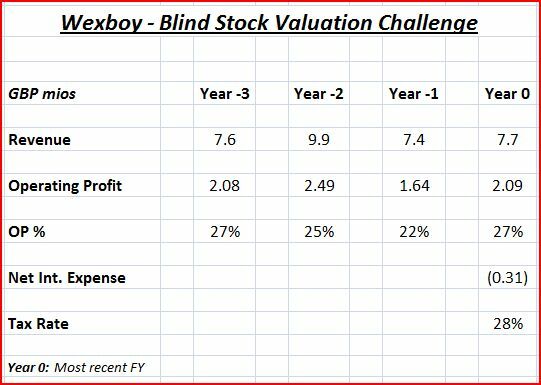 All your stock valuations should be blind stock valuations! – Go straight to the annual report…do not pass Go, do not collect 200 pounds. – Go straight to the accounts, and only the accounts. And don’t forget the bloody Cashflow Statement! – Still interested? Go back and read a few more sets of accounts, and nothing more. – Still interested? Now go back and read all the accompanying notes to the accounts & the auditors’ reports. – Still interested?! OK, only now should you go back and read the first half/management & directors’ section of each annual report! This approach tends to insulate you from management’s deceptively rosy view of the business, and perhaps some of your own preconceptions/biases. There’s also a lot less scope for ‘adjustments‘ on the face of the financial statements and, for any that do show up, you’ve the luxury of actually deciding whether to include or exclude them for your own analysis. Exceptional charges are the obvious cardinal offence these days, of course. Scanning some years of accounts makes you aware of how frequently (every year?!) these actually show up. Depending on management, or the industry, exceptional charges often seem to be just another regular cost of doing business, and should be included in your valuation analysis. Cross-checking the P&L against Cashflow is another great way of determining underlying profitability. In fact, I think I’d describe my approach as blind stock valuation squared..! Read some sets of accounts, form an opinion & valuation of the company, and then compare with management’s often v different figures & commentary. Amazed? Then compare with the actual market capitalization. Amazed again?! This is enormously instructive, and quite addictive – it’s always interesting to circle back after and compare the accounts vs. management vs. the market and think about what you got right, and what you might have got wrong. This is one of the best investing feedback loops I can think of (well, actual portfolio losses should be even more instructive!). So, what’s your price, boss – and how did you get there?! Please just comment on the post, or email me at wexboymail@yahoo.com if you prefer, and I’ll follow up asap when we hopefully have some decent feedback. Please pass along, blog or tweet about this challenge too, thanks! It’s quite an impossible task with just income statement numbers. The capital used in generating the returns is a vital part of the valuation. For participation’s sake, I’d pay the gypsy 11. I like the consistency and the high margins. I’ll be getting 1.1 after taxes and interest for a return of 10% annually with zero growth factored in. I’d be happy with that. I’ll bid even higher if further investigation confirms the business resilience, effective and efficient use of capital, and able management. You guys are cheap 🙂 which is quite the compliment in value circles, I guess. Very interesting! I agree with the others that we’re a bit short on data here, especially balance sheet stuff. What about D&A ? You’ve left it out so I assume it’s inconsequential. What’s going on with the cash generated each year? Paid out or held in granny’s little purse? Given the limited info, I might pay 6x after-tax cash flow (17% return on my investment) because there is a reasonable amount of debt (I’ll accept Richard’s 5 million pound estimate) yet there doesn’t look like much growth. This latter doesn’t exactly fit with a 1.4 million pound spend on R&D, but, again, lack of info. You say that CF is similar to Op. Earnings so I’ll ante up 8 million for the company (1.3 million after tax CF, if I understand your ‘net interest’ correctly, x 6 = approx. 8 million, no decimals for me). If there is some cash on the balance sheet I’d even give a bit more, say 1 pound for every 2 pounds of cash in the kitty (I’m a bit skittish because I don’t know what management has been doing with the cash generated in the past couple of years or whether they like big yachts). There has to be a bid/ask spread, this isn’t a ‘hin’ after all. Even your gypsy lad would have a spread. Just because I would only pay 8 million doesn’t mean I would sell for the same price. In fact, if I were the owner I think I might have just a bit more info (at least hopefully). The spread, in fact, should be pretty wide. I don’t think I’d sell for under 12 million, and probably alot more. If you’re asking what the market might pay for company X I’d first have to see their glossy brochure and their latest presentation. What, none? Oh, the company is too small for a PR department? Then I doubt Mr. Market will ante up more than I would. I too am looking to be suprised. Thks, gents, for responses so far! Everybody always wants more info… 😉 Interestingly, everybody’s marked it harder than I would – a surprise, it’s usually the other way ’round when I surf the web! Perhaps 2 reasons: I believe acquirers will pay a normal/decent price, without imposing a debt haircut, if debt’s reasonable/sustainable – therefore, personally, I wouldn’t apply a full debt haircut here on my final price. Also, I’d probably pay a little more for a stable business – but that’s on average reflecting some stable businesses deserve exactly the multiples you highlight, and even lower, but others may be relatively low growth but have v dependable revenue/profit streams which may deserve a significant/premium multiple (annuity-type business). But I’m not necessarily suggesting that here – and obviously the info. provided doesn’t allow you to make that kind of judgement. fyi, The company had GBP 1.4 mio spend on R&D in Year 0. Cashflows approximate what you see in the P&L. It was my price as a buyer what I was quoting :-). I do understand your point about the debt being reasonable. did they capitalize R&D? Don’t think we can come to a conclusion without balance sheets. No, it was a GBP 1.4 mio spend. [Actually, a minor portion (development) was capitalized, but the amortization charge for the year was almost identical] I only mentioned it now because I was fascinated at that level of R&D when I discovered it (buried in the notes!) – but I’ll be writing more about all that..! It looks reasonably stable, so let’s use earnings (you haven’t given us any choice, any way). Average operating profit is approximately £2m, which after tax is about £1.5m (ignoring interest). So I’d say a fair enterprise value for the unlevered business would be about £15m (if we assume everything you haven’t said about the business is OK!). It would have been nice if you had said how much debt the company has, but let’s say it pays interest at 6% then debt would be about £5m and market capitalisation £10m. So I’ll plump for £10m. I agree with red: insufficient information. Seems to be a stable business (but too few years data to tell), so shouldn’t command a high multiple. No indication of debt. My valuation methodology for a stable business, going nowhere, would be 5x free cashflow – after deducting debt (i.e. I’d pay 5x FCF for a debt free business). Reported profit alone offers no basis for valuation. But I’d also want to know WHY the business doesn’t seem to be going anywhere and whether earnings going forward are likely to be sustainable. The 5x multiple is a figure I’d use for a private business. Maybe 7x for a listed one (simply because the market for private businesses is generally weaker than stock markets). [When offering a chicken to your 6 y.o. gypsy, you do have to consider the chicken/egg market ;0)]. PS red – think you may have misread/calculated: your $36 value seems to be based on a multiple of REVENUE, not earnings! Not enough information to have an honest stab at it: margins are meaningless to me without asset turns. So, left with the needlessly haphazard option of capitalizing the OP at some multiple deemed “safe”, like 6x, and subtracting the implied net debt of ~6m to give $36 of “value”.